WAK’s paper and accompanying Authors’ note consistently conflate cultural practices with a mythical, fixed, universal sexual orientation. Hormones may well cause morphological differences in bodies, but this is the first study to suggest that lady fauxhawks, men’s sculpted eyebrows or other “grooming styles” are related to intra-uterine experiences. In his 2012 book How To Be Gay, David Halperin provided the definitive exploration of the supremacy of cultural behaviors. Being a gay man has almost nothing to do with manhumping, but rather with the careful cultivation of camp humor, a certain timbre of voice, or other learned styles. WAK practically write the book on dyke style: “lesbians tended to use less eye makeup, had darker hair, and wore less revealing clothes” (p. 20); they also smile less and wear baseball caps (p. 21). It’s puzzling to think that two smart people who grew up outside the U.S. would think these are universal cultural responses to uterine hormones. 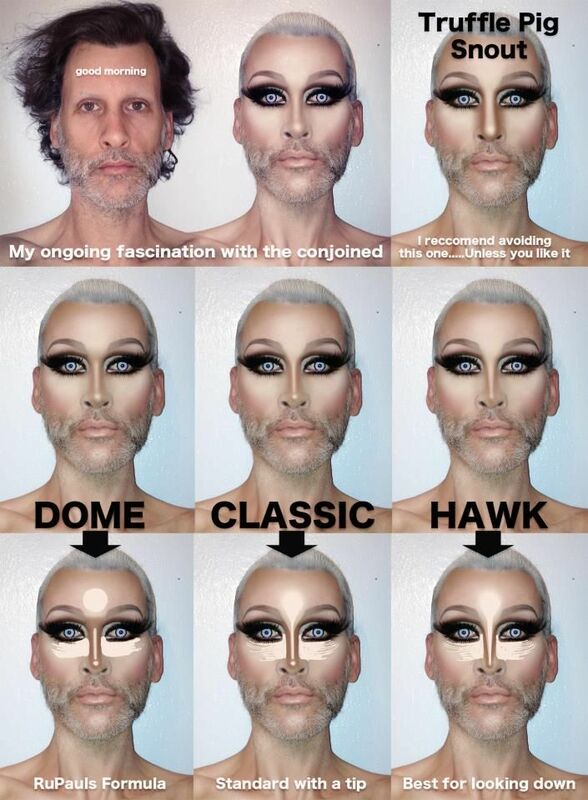 But then again, WAK think that nose shape and cheekbones are fixed landmark contours; if they’d ever met a drag queen, they’d know contour is a verb. There is a stunning assumption here: that dating site photos and profiles are unmediated, unmanipulated, accurate facsimiles of the real body (tl;dr they’re not). I will leave it to geneticists and biologists to critique the ways that WAK confuse correlations and causation (gender atypicality may cause gayness as much as gayness causes gender atypical behaviors). They might also critique the way WAK ignore 15 years of epigenetics research that shows that gene expressions (and the hormones that are regulated by them) are altered by complex interactions with environment and behavior over the life course. [Bloggers Bjork-James, Cohen, and Gelman offer important critiques of the data and its interpretation]. In that film, heterosexual actor Ben Stiller plays the eponymous male model Derek Zoolander whose dubs his signature facial expression “Blue Steel.” The humor of Blue Steel in the film lies in mocking the labor of models and their presumed homosexuality (Zoolander 2 ups the ante by adding transphobia to the mix). Its pleasure beyond the film, however, gave us the delightful scene of Stiller teaching iconically uber-gay Elton John to make the Blue Steel pose, a masterful exercise in gaysplaining (straight people helpfully but patronizingly explaining gay things to gay people). Blue Steel stories are now a staple item for slow news weeks in the celebrity world, with magazines and blogs “catching” celebrities making the face, and then ribbing them for it. Michal Kosinski is dismayed by ethical critiques of his paper, defending it on Twitter, Facebook, and public google docs that he edited through the weekend. WAK’s abstract does end with the warning that “our findings expose a threat to the privacy and safety of gay men and women.” This smacks of the local nightly news fearmongering about “the toxic poison lurking in your kitchen–after these commercial messages.” Indeed, WAK “were terrified” to learn that there are risks to the privacy of LGBTQ individuals, which they present as “the core message of the study” (Authors’ note p. 1). Mired as it is in outdated stereotypes, WAK should not be surprised that people didn’t hear their message for the offensive noise. Kosinski might have known better. After all, it was only last year that he was “horrified” to be suspected of developing the tools used by Steve Bannon-affiliated firm Cambridge Analytica to create winning campaigns for Brexit and Donald Trump [charges that were circumstantial and that he has forcefully denied]. He got over it quickly. “This is not my fault. I did not build the bomb. I only showed that it exists,” he told journalists for Swiss Magazine Das Magazin, translated by Vice’s Motherboard (“a good article,” Kosinski praised on Facebook). But WAK never address the fact that their research gives them the ability to sell both a refined bomb and a shelter from it–or to give either away for free. What’s creepier than Kosinski’s flawed algorithmics is his naïve confidence in the moral and political neutrality of science. On Twitter, Kosinski pleads: “no one seems to be asking ‘assume for a second [we] are right, what should we do to protect ourselves?’ (Sep 8). I went looking, and he has no answers for how we might shelter ourselves. Instead, he says we should just accept that we live in a post-privacy world, a intellectual stance that both explains the utility of his research and justifies it. Privacy is the refuge of the powerful, and the powerful can afford both shelters from bombs and to walk the streets naked. The poor, the undocumented, racial minorities, and bad queers don’t need righteous allies to tell us we’re surveilled. Kosinski thinks that tech companies or the government should step in to protect us, part of what Stanford Business School’s Insights described as “his optimistic vision of a world with less privacy but more tolerance.” Pause here for a moment. Kosinski thinks Facebook and Jeff Sessions will protect flaming gay boys and baby bulldykes from anyone inspired by his research. Until we all get to live in WAK’s fantasy world, they owe us tools and strategies to protect ourselves from algorithms like theirs, though doing so would require them to dismount from some pretty high horses. Greggor Mattson is Associate Professor of Sociology at Oberlin College and Director of the Program in Gender, Sexuality, and Feminist Studies. Of his author photo, friends said “gay,” “could be gayer,” and “the right amount of gay.” He received much great advice, including from Jonathan Doucette, Crystal Biruk, Davey Shlasko, Charley Sullivan, Jason Orne, Sarah Quinn, and Cynthia Taylor. He blogs at greggormattson.com and @greggormattson. Booth, Alan, Douglas A. Granger, Allan Mazur, and Katie T. Kivlighan. “Testosterone and Social Behavior.” Social Forces 85, no. 1 (September 1, 2006): 167–91. With respect, I wanted to read this through, but your choice of small font, low contrast, all conspired against you. And I might not be your targeted audience, but I wish you had spent more time upfront detailing what they did, how they did it, and how that is DIFFERENT from what others often do in Machine Learning. And if it’s not different, what that means for Machine Learning. Then again, something that may have helped would have been some subtitles for the various sections where you address these important goals of your post. I tried to address the formatting issues you raised but I’m not a wordpress guru.